and your self-esteem is in the toilet. Secret: it helps to have a buddy! It’s got to be someone who gets it. Someone who’s been there and knows first-hand. My FINAL Quit is the friend who understands how hard it is to quit. Told with raw emotion and humor, Young shares her journal from first toke to last and the realization that busting her addiction was really her soul’s journey to discover her Self… Written for both smokers and non-smokers, My Final Quit offers invaluable insights, useful tools, and great encouragement. To watch the movie trailer, click here. Judy, from Freeport, TX : Your book came and I found my self on page 60 before I knew it! It was like talking to you — REAL feeling expressed in a conversational manner and very informative to this non smoker! It has to be a winner to capture the attention of a non smoker!… Love your book!!! I’ve told so many people about it! Even for a non smoker, it’s informative and a fun read! I’ve laughed and laughed as well as reflected on a number of things you wrote about! You really have the gift of communicating — so glad that you are sharing your interesting thoughts, knowledge and sense of humor with the rest of us! “Closet smoker’ from Houston, TX: Pam, it is nearly 3 months now…and no lapses, thanks to reading your book. It is hard to explain why the temptation to light up is still a daily challenge..especially in my car driving to Houston. When the craving comes, I think of your journal and just take a few deep breaths. Your experience and your title provide help to remind me that this is my FINAL quit! Thanks again. 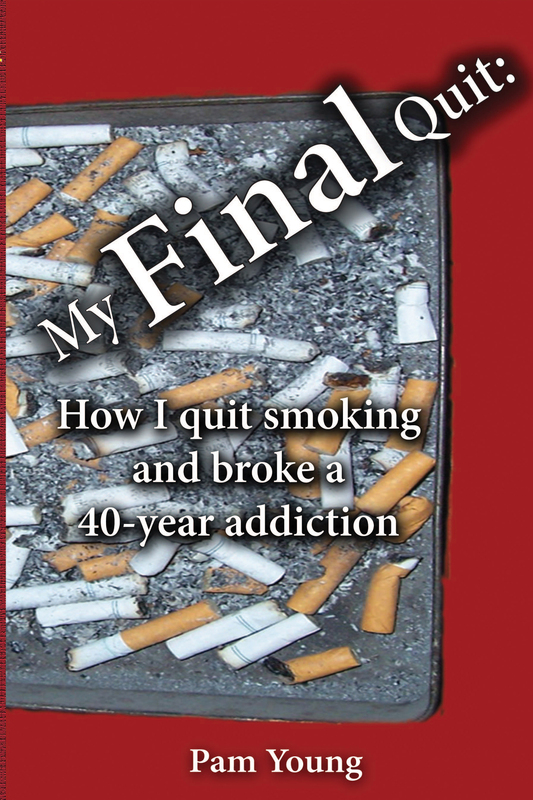 If you have ever tried to quit smoking, or any other addiction, and wished you had a friend to understand what you are going through and support you, now you have one in Pam Young and her compelling book, My Final Quit: How I Quit Smoking and Broke a 40 year Addiction. Pam details with honesty and with humor the trials of stopping the smoking habit/addiction. Each chapter begins with salient quotes from famous people pertaining to the topic at hand. A couple of my favorites: “If at first you don’t succeed, you are about average” by M. H. Alderson, and Sir Winston Churchill: “Success is the ability to go from failure to failure without losing your enthusiasm”. What the author details is not only about stopping a self-defeating addiction, but also about the spiritual journey to an expanded understanding of who she really is beyond roles and stereotypes. This book contains many ways to become your own best friend written with wisdom and wit so that it never becomes tedious or preachy. The last two chapters I find particularly valuable sources of information e.g. the use of amino acids and nutritional supplements to balance the body chemistry, as well as practical steps to take to prepare yourself before you embark upon your own final quit . Much of it Pam learned the hard way, and she offers to you in the very beginning of your journey. She shares the guidance she received in some details as well as in a comprehensive List of References from such as Felicia Drury Klimmet’s Eat Right for Your Metabolism, Julia Ross’s The Diet Cure, and Terry Rustin’s Keep Quit-A Motivational Guide to a Life Without Smoking. She also shares online resources for help to quit your addictions. If you read this book and take her advice, the way will be made easier for you too, to quit smoking and have a happier, healthy and more rewarding life. Your book looks awesome! Though I’ve never been a smoker, I think I’d love the book anyway…boy, how many things I need to quit! It’s inspiring to hear about your journey. Thanks, Kathleen. Quitting was an amazing journey. My boyfriend has been skiomng for 30+ years and he keeps saying he wants to quit. He has tried a couple of times and managed to go with cigarettes for two days once when I still lived out of state from him. The other day he said he was sick of all the crap that skiomng did, like costing extra and making him cough, and that he really was going to quit.I want to help him do this but I am not sure how. The situation is a bit complicated too. On one hand we live together so when he is home I can really help him. On the other hand he works Mon-Fri as a programmer at least 8 hours a day. Almost all of his co-workers smoke from what I have heard of the office stories.I heard that there was some trick to show how much you smoke a day. I think it was putting gumballs in a jar for each cigarette you smoke and trying to get it to less and less gumballs every day. Anyone else heard of something like this?Also any other ideas about how I can help him at home and try to help keep him strong at work? I do have a way to im him at work but I don’t want to be sending him stuff he would be embarrassed about if a co-worker saw it. I know it has to be gradual so I am not looking for a magic fix. Please help me help him.One more thing, he had a bad reaction when he tried the nicotine patch so that is a no no.He said that when he put on the patch his arm got all red and swollen. This was several years before we started dating but it is strange that he would have a reaction to it since you say it is the same drug as cigarettes. I will try to talk to him about it. Indeed. That’s why I wrote the book–for both smokers and non-smokers. My best ideas are included in the book.